People survey the damage of the shopping mall following earthquakes and a tsunami. 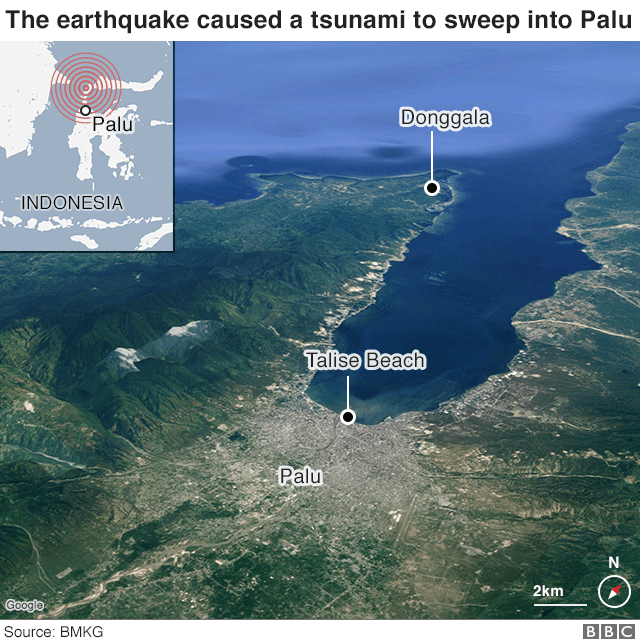 (by Niniek Karmini, Associated Press) PALU, Indonesia — Rescuers struggled Sunday to reach victims in several large coastal towns in Indonesia that were hit by an earthquake and tsunami, and authorities feared that the toll of more than 800 confirmed dead would rise. 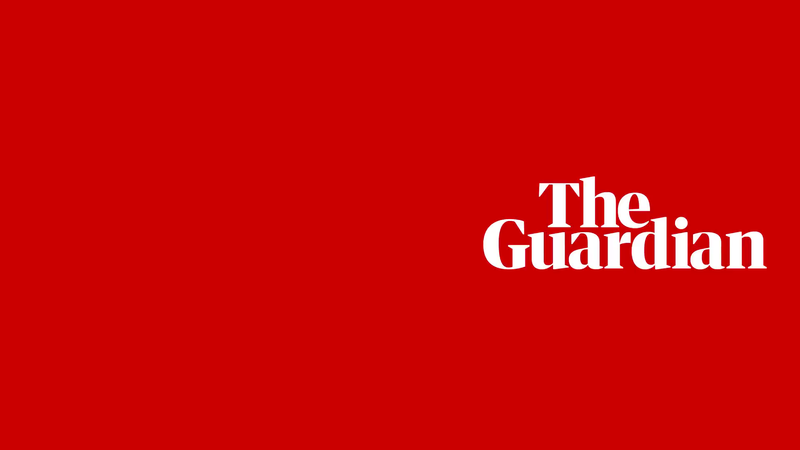 It was not immediately known when the burial would take place, but “this must be done as soon as possible for health and religious reasons,” said Willem Rampangilei, head of the National Disaster Mitigation Agency. Most of Palu’s residents are Muslim. … Indonesian President Joko “Jokowi” Widodo toured Palu on Sunday and said rescuers were having difficulty reaching victims because of a shortage of heavy equipment. 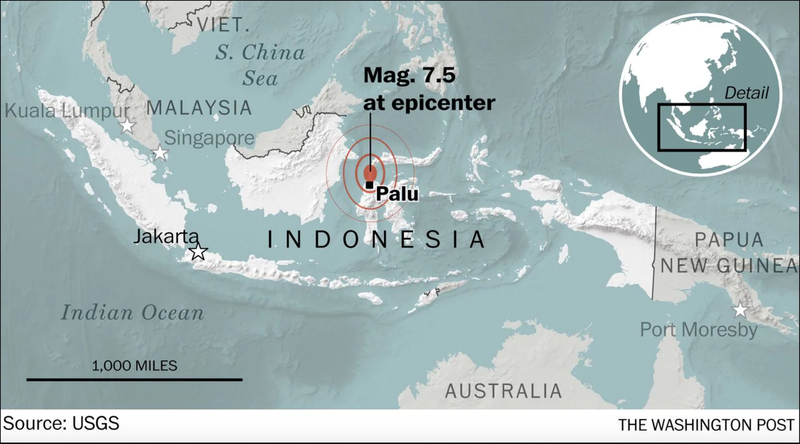 “There are many challenges,” Jokowi said. “We have to do many things soon, but conditions do not allow us to do so.” He said authorities were deploying more heavy machinery so emergency workers could help recover more victims Monday. 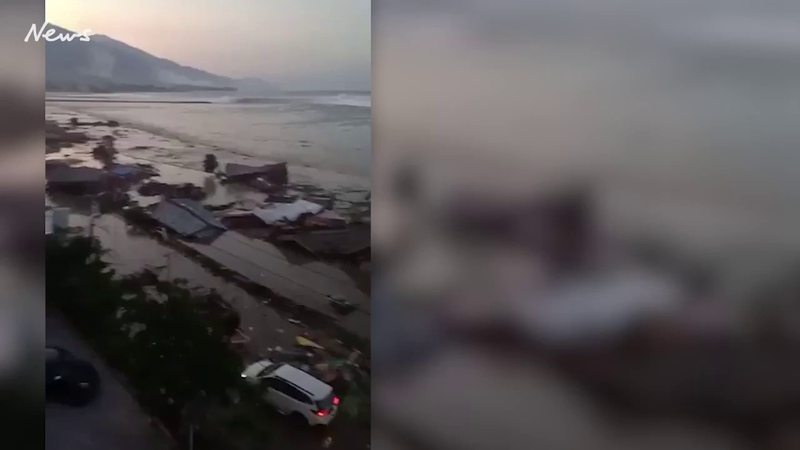 In Donggala, the site closest to the epicenter of Friday’s earthquake, aerial footage on Metro TV showed the…sands of beaches swept out to sea, along with some buildings. Some buildings in the town were severely damaged, with plywood walls shredded and chunks of concrete scattered on the pavement. Much of the damage, however, appeared limited to the waterfront. The city is built around a narrow bay that apparently magnified the force of the tsunami as the waves raced into the tight inlet. Nugroho, the disaster agency spokesman, said waves were reported as high as 20 feet in some places. Published at Associated Press on Sept. 30. Writers Margie Mason in Jakarta, Indonesia, and Stephen Wright in Makassar, Indonesia, contributed. 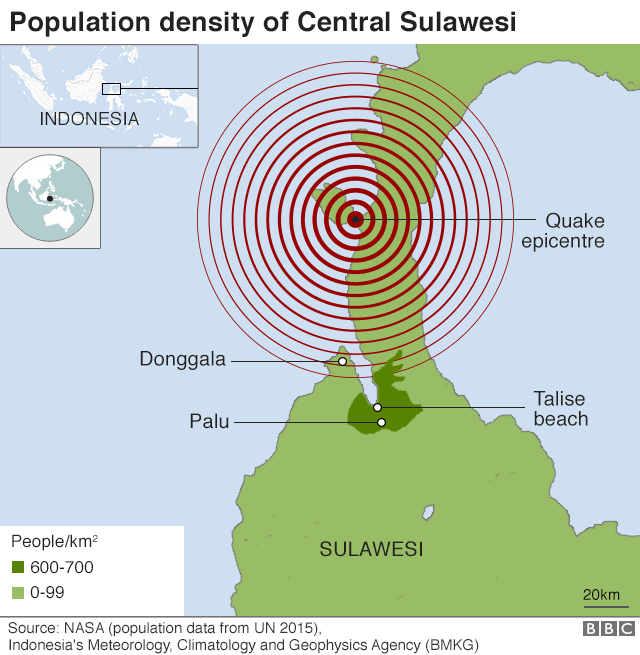 A 7.5 magnitude earthquake struck the Indonesian island of Sulawesi on Friday at about 6pm and was followed by a tsunami with waves up to [20 feet] high. 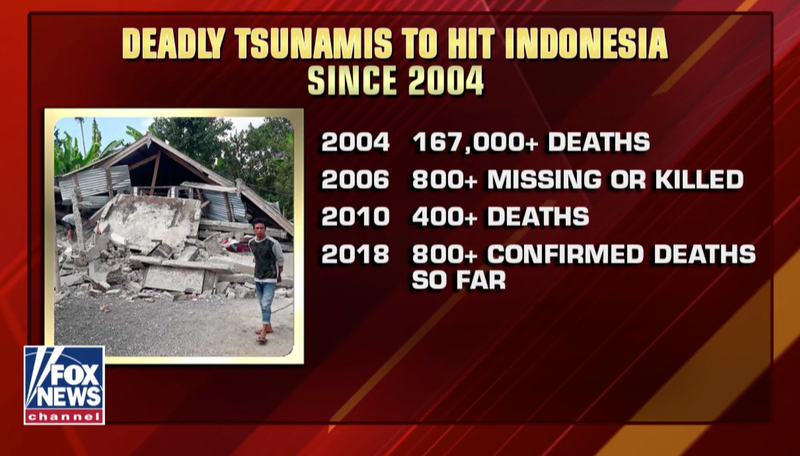 The death toll from the earthquake and tsunami currently stands at 832, but is expected to rise sharply. 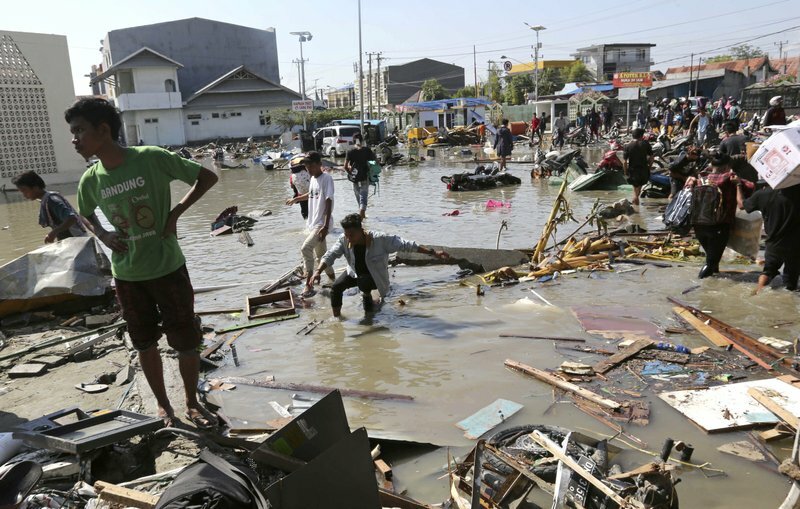 Authorities have said the final death toll could reach the thousands as rescue teams push into the Donggala region, which was directly hit and is home to 300,000 people. 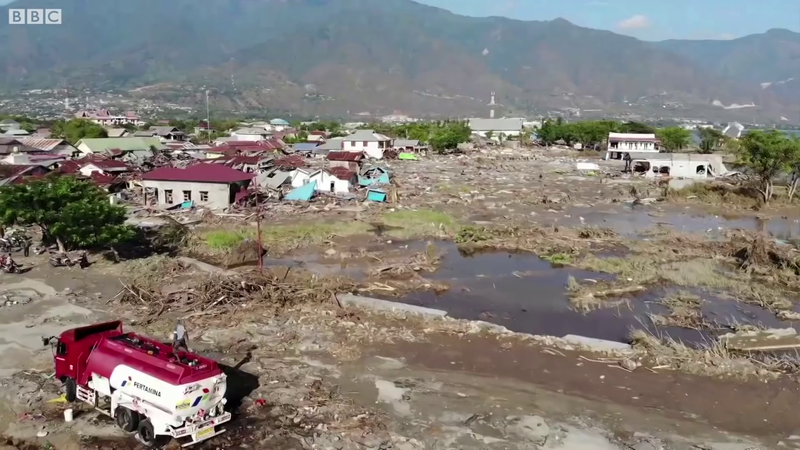 In some of the smaller villages and subdistricts around Palu, it is feared entire communities of up to 2,000 people have been killed after mudslides submerged and crushed their homes. A 14-day state of emergency has been declared in Sulawesi. Heavy machinery needed to move rubble has still not reached the area, so search and rescue efforts are being done primarily by hand. Some telecommunications had been restored to the area but there continues to be no power in Palu. There is also a shortage of food and fuel in the city, with huge queues at petrol stations. The structural damage done to prisons by the earthquake allowed for a massive prison break across the area. 1,425 prisoners are now missing from jails. b) How many people were confirmed dead on Sunday? c) Why do authorities fear the death toll will climb much higher? d) As of Sunday, why were rescuers having trouble reaching victims?